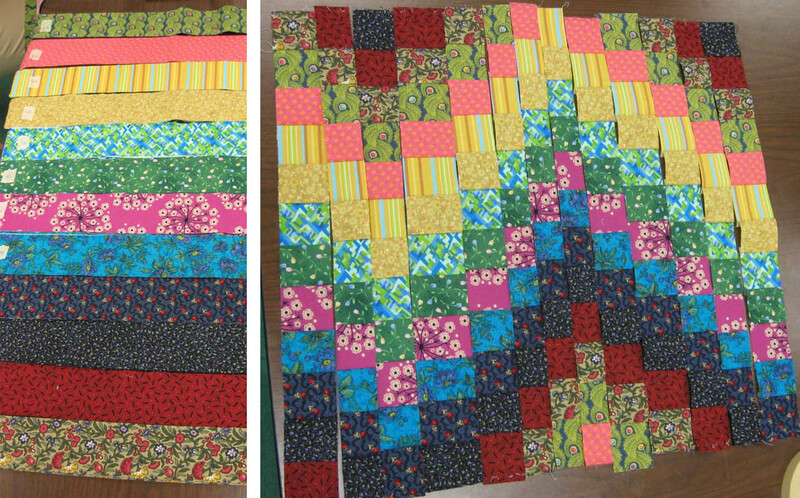 I was invited to teach a special class on Bargello Quilting for the staff at Chattanooga Sewing Machine Center. 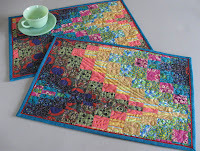 We met in the classroom after closing, ordered in pizza, and had a fabulous sit-and-sew-and-chat session while they learned to make Bargello placemats. The class project (left), with its waves of color superimposed on a geometrically influenced design was not—I was told (and much to my surprise)—the primary aspect of what drew the staff and customers to this project. It was the quilting! 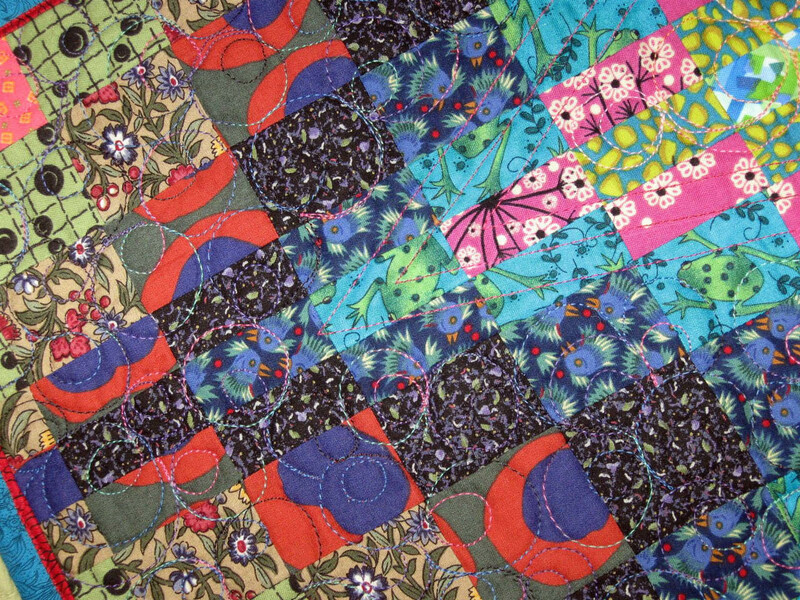 Closeup of machine quilting on Bargello placemat. While store customers loved the bright, saturated colors, the staff said there were many comments on how the quilting accentuated the movement and color placement on the placemats. Well, you just never know what catches people's eye, do you??? 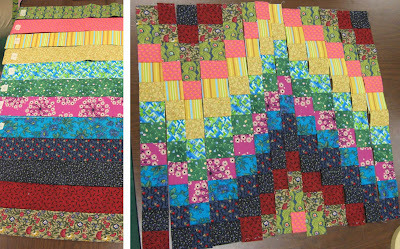 I provided kits with pre-cuts strips for this class, so the staff could just sit and enjoy the sewing after working all day. 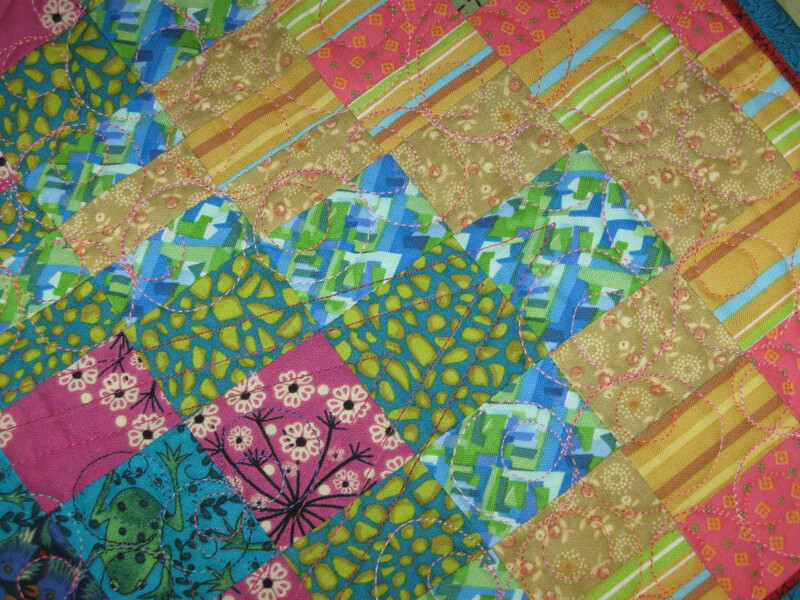 With a few slight variations in the kits (one wanted a few more brights to complement her dinnerware, and one wanted some golds and greens thrown in), the fabrics were mostly all the same. So, despite very similar fabric kits, here are the variations on a theme that resulted from the evening's class. 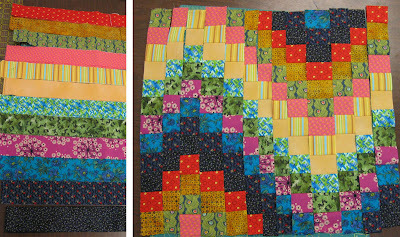 The set of fabric strips is shown on the left of the composition. 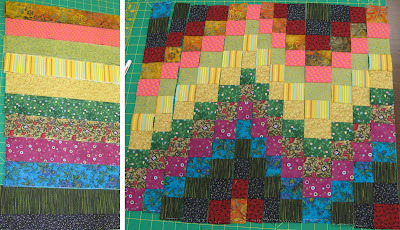 The greens and golds in Linda's version contrast with the salmon pink and turquoise. Lisa's version has bands of lights and darks running through the center. Michelle's version has the deep red and a bright pink flanking the center dark wave. 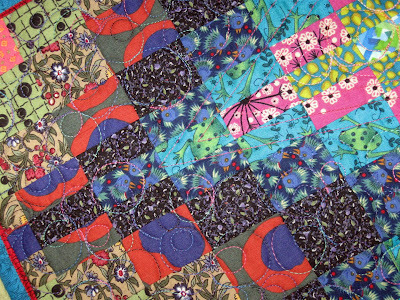 Notice the opposing placement of the zinger fabric in Sheri's version. I must say that is was a real pleasure having these women in a class together. Their sewing and piecing skills are top notch and they listen attentively to instructions and demonstrations. They were excited by the results they were getting and inspired to experiment with variations on the other three placemats. 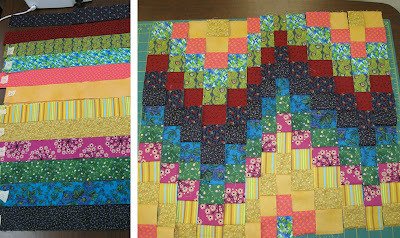 It will be interesting to see what each one chooses for the binding and how she decides to quilt her piece. My sample was quilted with a combination of straight line quilting and free-motion. Thank you to Linda, Lisa, Sheri and Michelle for a fun evening! Can't wait to see your finished pieces. What do you want to do next?? It was a fun evening and I am inspired! Thank you again, you are not only an awesome teacher but a great gal!! Love seeing and hanging out with you. I'll be watching your adventures via your blog. Chelly--The pleasure was all mine. I was happy to spend an evening with you all and share our love for fabric, thread and color. You did an awesome job!